Classic newly re-decorated Canal Home with 4 bedrooms and 2 full bathrooms. 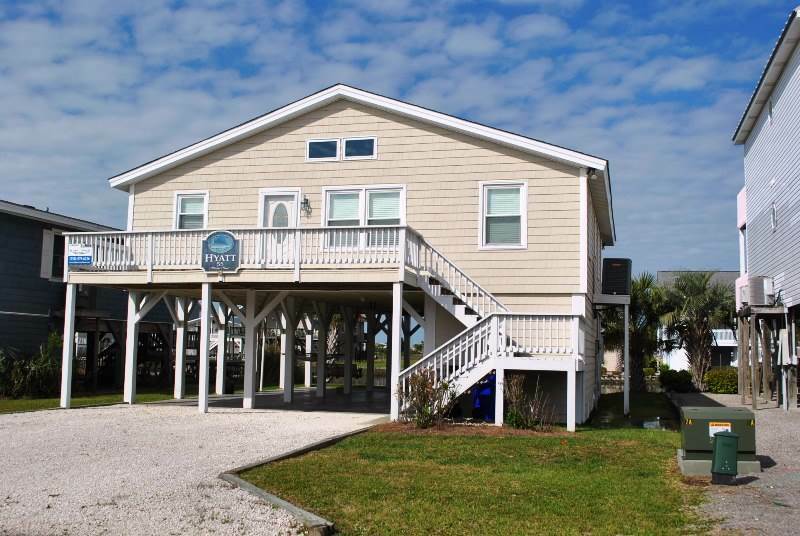 Well loved and maintained with a private boat dock, easy access to the Intracoastal Waterway. Large living and dining area with fully equipped kitchen with newly installed hardwood floors. Four bedrooms flank either side of the living space with a shared bathroom on each side of the home. Large flat panel TV with a DVD player, two additional flat panel TVs in bedrooms. Ceiling fans, wireless internet access, telephone with domestic long distance, large covered back deck with sundecks as well. Other amenities include a new washer and dryer (ground level closet), charcoal grill, hot and cold outside shower. Monroe Street has direct beach access at the end of the street (just a quick stroll), and the OIB Community Center Building with bathrooms is also at the end of the street. Non-smoking, no pets. NO NIGHTLY RENTALS FOR MEMORIAL DAY OR LABOR DAY HOLIDAY! Accommodate 10 in the following bed configurations: King, Queen, Queen/Single, Double/Single. Light and airy. Great porch with swing and view of the canal. My family loved it. We hope to stay there next year - It will be the first time we have stayed in the same place at Ocean Isle. We have gone every year for 8+ years and this is the only house I would want to rent a second time.